Industrial secondary containment sealer is an important part of your infrastructure serving to meet EPA guidelines by capturing liquid spills and chemical spills. Companies using indoor and outdoor tanks, mixing vessels, or drum storage need an industrial secondary containment sealer. 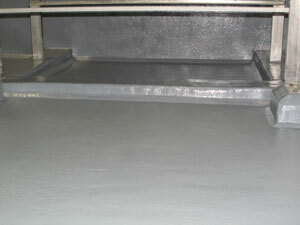 Concare has the skills and expertise to recommend, prepare and apply industrial secondary containment sealer barriers. We work with you to determine the best industrial secondary containment sealer and system based on your environment including temperature exposure, chemical concentrations, fire retardance, and other important factors. These applications include both floor and walls, curbing and / or secondary containment dikes whether inside or outside the building. Contact us to protect your industrial secondary containment with a sealer to protect from chemical spills and liquid spills.